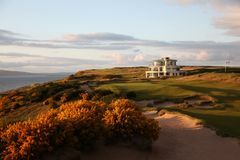 Castle Stuart is the most exciting project in UK golf since Kingsbarns opened for play. It is regarded as a model for modern golf architecture, being fun, engaging and playable for everyday players of all abilities, but also a challenge for the very best. Located just a few minutes from Inverness and it's airport, the exceptional golf course sits on the shores of the Moray Firth with amazing views of the Black Isle and beyond. Designers Mark Parsinen and Gil Hanse have capitalised on a majestic parcel of land to carve a golfing marvel. The spectacular setting overlooking the Moray Firth presents a memorable seascape punctuated with local landmarks such as the Kessock Bridge, Chanonry Lighthouse, Fort George and Ben Wyvis. Castle Stuart is the epitome of contemporary links course architecture. Here nature bequeathed an opportunity for a links golf course to enjoy a rich landscape texture of whins, gorse and broom, heather and marram – a landscape mosaic of rugged beauty. It is a true links experience with rumpled fairways, offering changes in lie and stance; partially revetted, natural bunkers and infinity edge greens that allow the scenery and key landmarks to be put on display. Having played host to the Scottish Open four times since it opened in 2009 with champions including Luke Donald, Jeev Milkha Singh, Phil Mickelson and Alex Noren, Castle Stuart has become a must play when visiting Scotland.